In 1908, Pierre-Auguste Renoir chose to take up residence in the hills behind the seaside town of Cagnes-sur-Mer on the French Riviera. Taken by the climate, the light, and landscapes of this area, Renoir painted olive and fruit trees, flowers, as well as his muses, and began sculpting for the first time. 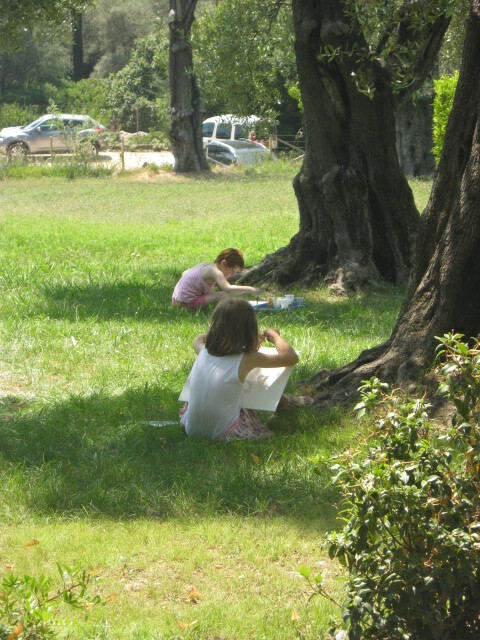 His residence is now a museum and a source of inspiration to young artists, who I saw drawing “en plein air” sitting under olive trees on the grounds. 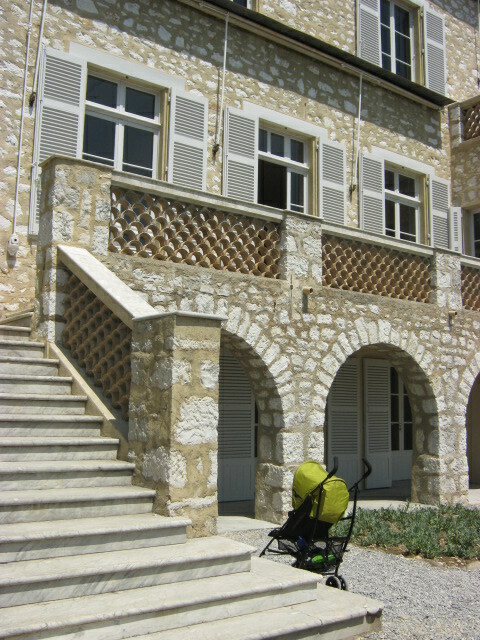 The museum reopened July 26, 2013, having been closed 18 months for renovation. Walking from the Nice Opera, go directly through Cours Saleya to the end and turn left onto rue Gilly, walk straight ahead to the Y in the road and “La Ferme Saleya” restaurant is just there to the left. What a find! 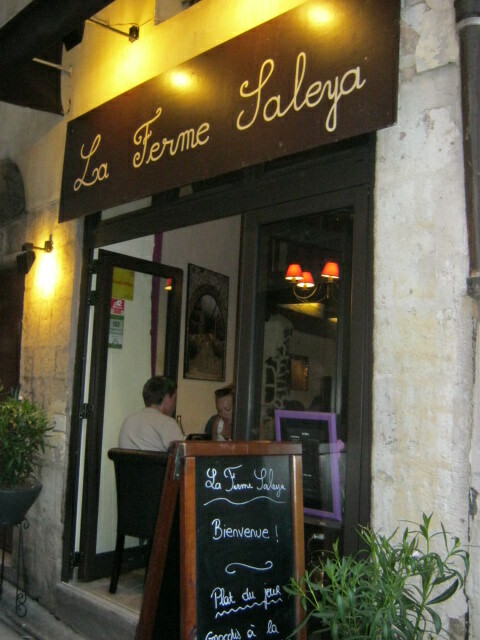 This place is charming, has wonderful service, and the food is excellent. 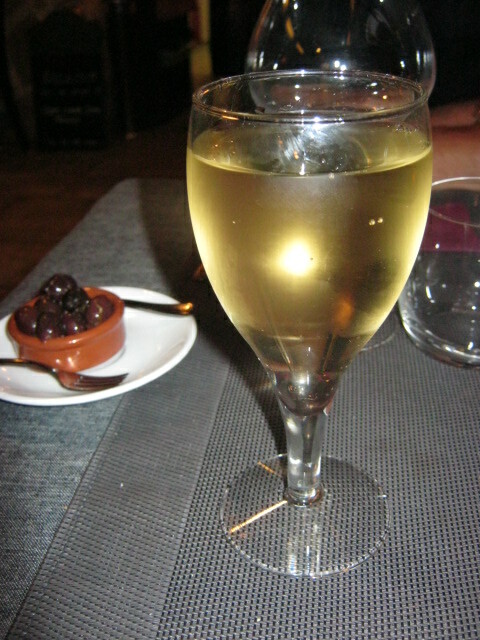 They even served a free Kir to customers who arrived before 8pm to have dinner – I ordered a Kir Peche (peach) rather than my typical Kir Cassis (black currant) – it was delicious! I highly recommend this restaurant and definitely plan on having lunch there next time. See you there! Hard Rock Café NICE ! We’re #2! 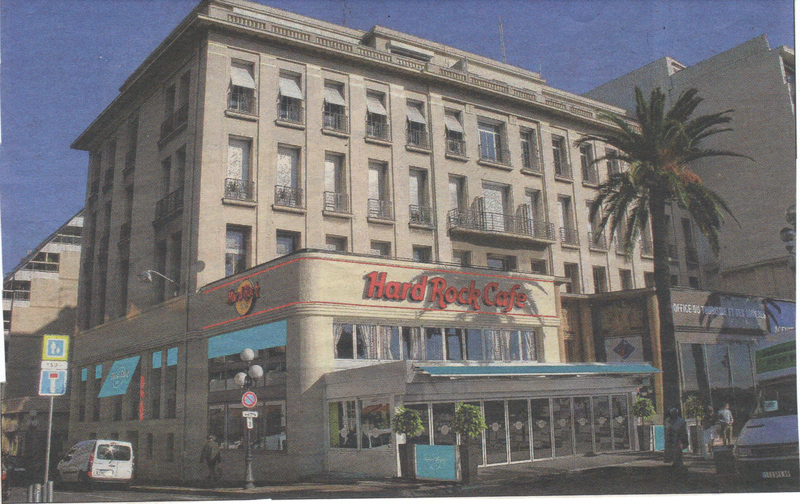 Nice is the site chosen for France’s second Hard Rock Café, the first being in Paris. 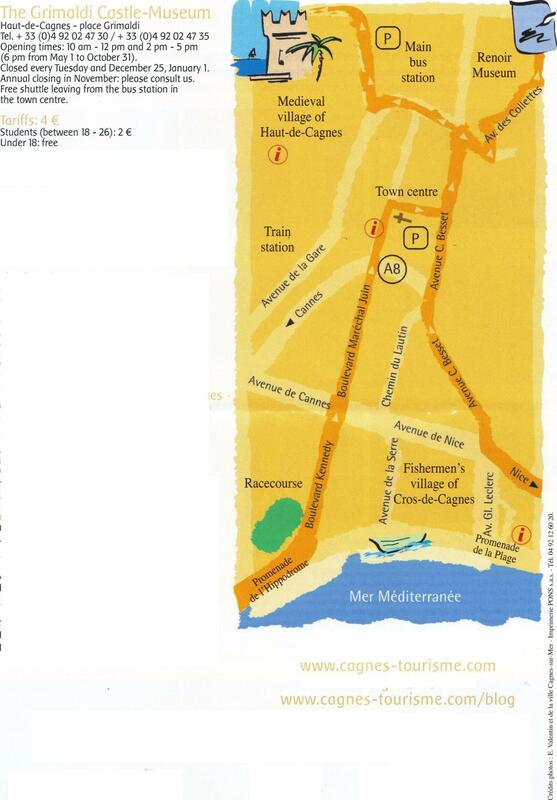 Situated at 5, Promenade des Anglais, next to the Office de Tourisme, the two floor, 557 square meter café will open in mid-October, 2013, employ around 70 people, and seat 200 clients in the restaurant and 30 on the terrace. There will also be a bar and and “Rock Shop” boutique, selling iconic tee-shirts and rock inspired articles. Nice’s café will have an interactive wall with technology allowing fans to tactilely view rock memorabilia and virtually visit other Hard Rock Cafés around the world. A jacket worn by Justin Timberlake, a red accessory item of Rihanna, a 1970 costume worn by James Brown, and a drumstick used by the drummer of Guns & Roses are just a few of the rock ‘n roll iconic items that will be decoratively displayed at the café. Since 1971, Hard Rock Café has been associated with philanthrophic activities around the world. Hard Rock Café Nice will continue that philosophy, aligned with breast cancer awareness and other causes chosen by the greatest pop rock artists, through their Tee-shirt Signature Series program, as well as supporting local associations. “France produces 18,500 tons of garlic per year, in areas scattered throughout the country. Several varieties have what is called an IGP (Indication Géographique Protégée), a European label that guarantees the region of production, and specific growing and preparation standards. Among the primary garlic varieties in France are l’ail rose de Lautrec (Midi-Pyrénées), l’ail blanc de Lomagne (Midi-Pyrénées), l’ail d’Auvergne, l’ail de la Drôme, l’ail de Provence, l’ail fumé d’Arleux (Nord-Pas-de-Calais), l’ail de Cherrueix (Bretagne) and l’ail violet de Cadours (Midi-Pyrénées), the only garlic with an Appellation d’Origine Controlée, a hard-won pedigree that underscores the quality as well as the cultivation and preparation of the garlic. There are two major categories of garlic in France—that planted in spring and that planted in the autumn. Both are harvested in July. One of the more distinctive varieties is the mild ail rose de Lautrec, with a rigid central stem that makes it impossible to braid. Instead, growers first peel the heads down to the first skin, so the pink shows through, then tie it into fat, heavy bouquets. Another variety that stands out is the golden smoked garlic of northern France. Its production is concentrated around the town of Arleux in the Pas-de-Calais region, and it represents ten percent of French garlic production. The cloves are pink, but smoking over a peat fire obscures their color and turns the outer skins deep golden and slightly sticky. The reason for the smoking is the climate. The north is damp, without enough sun to dry the garlic; the smoke preserves it, preventing it from getting moist and spoiling. This sauce evokes Provence at its productive best, in summer, when farms and family gardens are at their peak, yielding vegetables with an incomparable depth of flavor. Note: When making aioli—or any mayonnaise-style sauce—think slow, slow, slow as you add the oil. If you do, then you’re guaranteed success. But if the aioli does separate, put an egg yolk in another bowl and slowly whisk the separated aioli into it. 1. Make a paste of the garlic and salt in a mortar and pestle, by working the pestle around slowly, always in the same direction, in the mortar. If you don’t have a mortar and pestle, either finely mince the garlic with the salt, transfer it to a medium-sized bowl and press on it with a wooden spoon until it makes a rough paste; or simply mince the garlic and salt together in a food processor and transfer the mixture to a medium-sized bowl. 2. Whisk in the mustard and egg yolks until they are blended with the garlic and salt. Then, using either the pestle or a whisk, add 1/4 cup (60 ml) of the neutral oil very slowly in a fine, fine stream, until the mixture becomes thick. Don’t add the oil too quickly or the mixture will not emulsify. 3. Add 1 teaspoon of the lemon juice to the oil and garlic mixture, then add the remaining oil very, very slowly, whisking or turning the pestle constantly. The aioli will gradually thicken to the consistency of a light mayonnaise. Adjust the seasoning, and add more lemon juice if it needs more tang. If it becomes very, very thick you might add 1 tablespoon of warm water to loosen it. 4. Taste for seasoning and add salt if necessary. Aioli will keep for several days in the refrigerator, in an airtight container, but is best served within 24 hours of being made. Susan Herrmann Loomis teaches cooking classes in Normandy and Paris. www.onruetatin.com. Let’s face it – we don’t really know what’s going to interest our audience in the world of blogging, as there is so many blogs and so little time. I try to write informative articles, yet amusing and entertaining ones to pique readers’ interest and loyalty. I was surprised that every day someone does a keyword search for Starbucks, but I had no idea that that topic would be the top post so far – go figure (pun intended)! Hips don’t lie and these stats don’t lie! 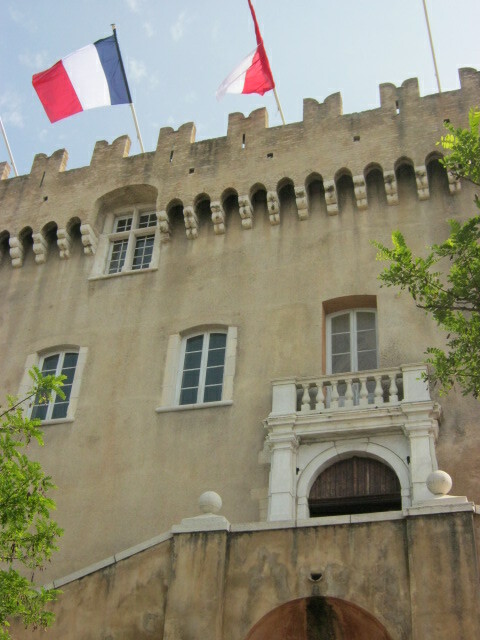 His Serene Highness Prince Albert II of Monaco was scheduled to visit the Grimaldi Château in the medieval village of Cagnes-sur-Mer. The conversation then led to where I was from and how I like living in France, followed by a comment he made to the nearby mayor saying, “Louis, elle est americaine” to which the Mayor responded to me, “Tous mes hommages, Madame.” The Prince and I continued to chat for a few minutes more about the village and if I have family here, etc. I was nervous at first (didn’t even mention my name), but the Prince was so charming and down-to-earth that soon the conversation felt comfortable, and I wish I had had more time to talk. How wonderful it would be to have a chance to interview him! Did I mention that he was very charming (and also taller than I had expected)! France’s bureaucracy is notoriously slow and for many foreigners, very confusing. But life is about to become simpler as the French government unveils a new series of measures to ease interactions between the French State and its citizens. From driving penalty points to paying VAT, the new set of rules could make ‘l’administration’ more modern and user–friendly. Among the most expected measures, the life of a carte d’identité (ID card) will be extended from 10 years to 15 years, saving money and many hours at town halls in the process. The restaurant tickets system, whereby certain companies give their employees around eight euros a day to spend on lunch, will also be simplified. Before the end of the year, a rechargeable card will replace the paper system to make paying for food more convenient. Around 3.5 million French workers use the restaurant tickets system. Checking how many points a motorist has lost on their driving license will also become a little less time–consuming since the data will be posted online for drivers to consult. Businesses are also set to benefit from the government’s plan, with obligations for trading firms to register with French tax authorities to be removed. Those companies will only have to register with their chamber of commerce, cutting paperwork and costs by half. Several administrative procedures for businesses will be achieved online, such as payment of the VAT, which represents five million bills sent to the State every year. Prime Minister Jean–Marc Ayrault said the measures will save the country around three billion euros in 2014 by speeding up and simplifying the interactions between the French State and businesses, as well as those who live in the country.